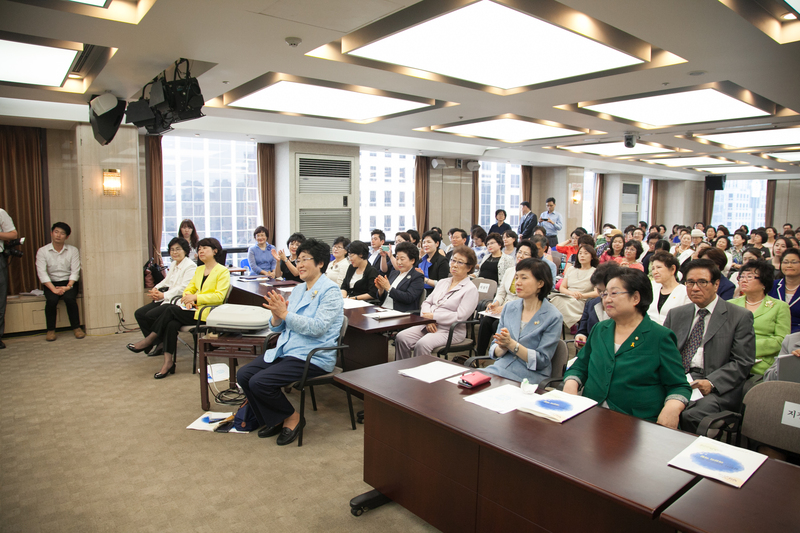 The Korean National Council of Women (President Kim, Jung-sook) successfully held the Anti-corruption Campaign Ceremony to help in the creation of a cleaner, more transparent, society. The ceremony took place at the Press Conference Room of the Press Center (19F) in Seoul at 2pm on June 25, 2014. Some 200 women leaders from various fields, as well as officers of member organizations, participated. Insightful and objective discussions ensued, with a decidedly practical orientation concerning how to bring about transformation of the existing social and political environment. Transition from cultural norms and practices which are tacitly tolerant of corruption to a “cleaner” reality was examined under the theme “The Role of Women in Creating a Culture of Corruption Intolerance”. Receiving special attention at this symposium was a ceremony to acknowledge exceptional civil servants who might be called “Clean Women Politicians.” These women were identified from the results of a nationwide survey focusing on corruption: sample size 4,000, conducted in April and May, 2014. Each recipient was awarded the “Plaque of Transparency” as a symbol of their commitment to an honest and open political system. 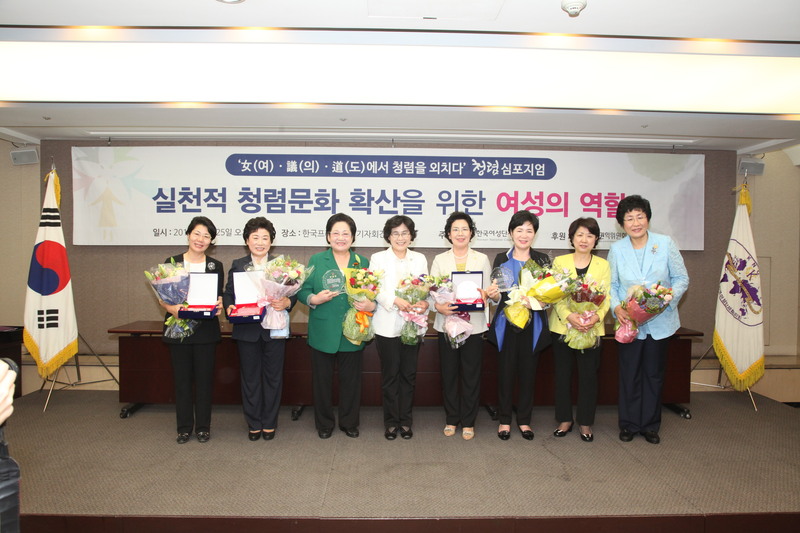 Recipients of the Plaque of Transparency award were Congresswoman Kim, Eul-dong; Congresswoman Kim, Hee-jung; Congresswoman Sim, Sang-jung; Congresswoman Yoo, Seung-hee; Chief of Pusan Jung-ku Office Kim, Eun-sook; Chief of Pusan Sasang-ku Office Song, Sook-hee; Assemblywoman of Jangheung-kun Jonnam Kim, Bok-sil; and Assemblywoman of Kangjin-kun, Jonnam Moon, Chun-dan. Following the awarding of plaques, there was a brief ceremony where further commitments to the principle and practice of transparency could be made. President Cho, Eun-kyung (EK Ethics and Knowledge Research Institute) continued with an analysis of certain findings of this year's “Survey on Citizen’s Attitudes Towards Corruption”. 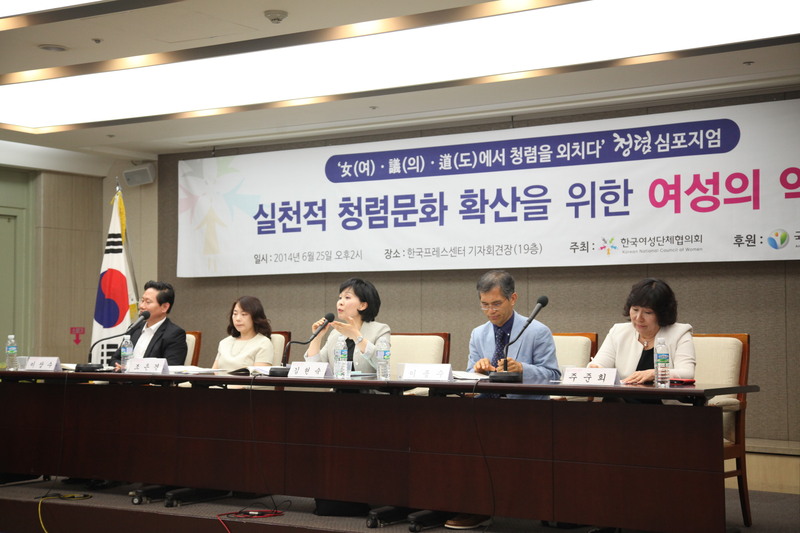 She stated, “The citizens participating in the survey were aware that the level of (anti-corruption) transparency in Korean society is low due to the diverse nature and composition of corruption-- insensitivity to corruption, nepotism in the over-valuing of school connections and local connections, irrational laws and dysfunctional institutions”. Most urgent, indicated many respondents, was the need to eradicate corruption in politics. There was general agreement with the notion that the more women there are in politics, the more transparent Korean society would become. Cho concluded by contending that diverse and active roles assumed by women would promote a political culture more intolerant of corruption and lead to far greater transparency in political and social activities. President Joo, Junhui (Women’s Institute for Negotiation & Leadership) indicated in her presentation on “Women’s Role in Expanding Clean Culture,” that there is a pressing need for a broad-based social movement to promote transparency and raise ethical standards in society. Such a movement must work in tandem with the development of laws and institutions designed to combat corruption. She pointed out various elements of contemporary Korean culture that might be seen as corruption-friendly -- collectivism, emphasis on relationship over justice, and existence of societal norms that seem to hold excessive regard for entertainment. 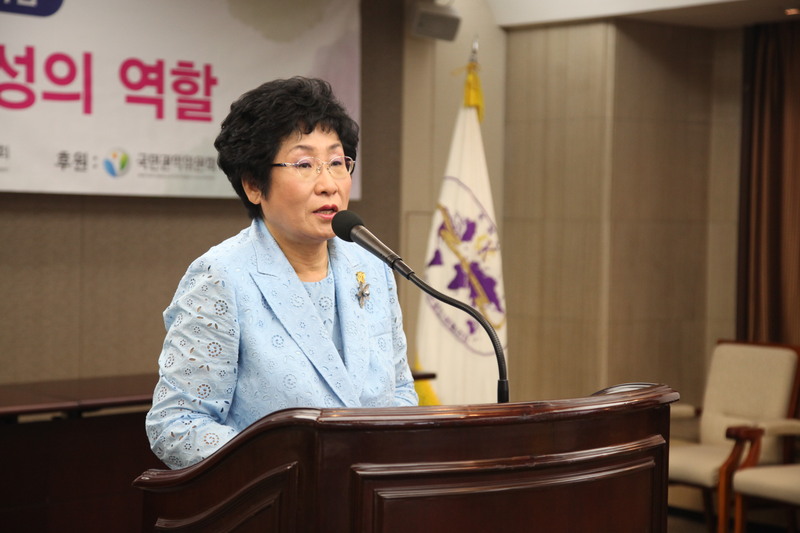 Dr. Joo emphasized the role of women as mothers and wives in creating clean culture. She said, “The role of woman as mother carries special importance in developing clean culture because of a mother’s efforts in teaching her children right from wrong. This message, the distinction between two opposing values, between two courses in life, must have lasting impact on a child's world view and on how the child will eventually choose to operate in that world. Likewise, a woman's role as wife can have a major impact on the social fabric of a nation-- a wife who extols the virtues of a simple, less materialistic, life may be sending a message to her husband which minimizes his consideration of corrupt alternatives in his behavior.” At a different level, she also contended that women who are less contaminated by corrupt political culture should advance into politics for a clean society to eventuate, and, furthermore, a 30% quota for women should be set in place in the cabinet, in the national assembly, and every other institution making important decisions in society. Presentations were followed by a lively round of questions and answers. Chairwoman Oh, Kyung-ja (Law and Regulations Committee) contended: “External organizations should participate in the activities of the Board of Audit and Inspection of Korea thus allowing a higher level of insularity in promoting movement toward a clean civil employees culture”. Professor Lee, Jong-soo agreed that it was very important to ameliorate what might, in kind terms, be called the stiff practices of civil servants. Clean culture is, to Professor Lee, an entirely worthy target. In concluding the symposium, President Kim, Jung-sook of the Korean National Council of Women said, “It is reported in the cases of many advanced nations that the more women participate in politics and business, the more clean and transparent the society becomes. It is therefore important to increase women’s participation, and women themselves should be aware of the need for, and advantages of, a clean society. It is imperative that women take the initiative in making this goal come to pass.” She went on to say, “The Korea National Council of Women will initiate and execute activities necessary to expand the concept and practice of clean culture in the future. A pro-active special committee will be formed to attenuate corruption and to suggest implementation of, and modification of, relevant policies and institutions in a concerted effort to expand clean culture.” President Kim concluded the symposium by pledging that women, in response to a well constructed Plan of Action, will realize great success in the clean movement, thus proving that women can play yet another vital role in propelling the country to advanced nation status.